News Corporation CEO, Rupert Murdoch, turned 80 on 11 iii11. His mother and father, Dame Elisabeth and Keith Murdoch have been inspirational for the Australians of Arabia Project. 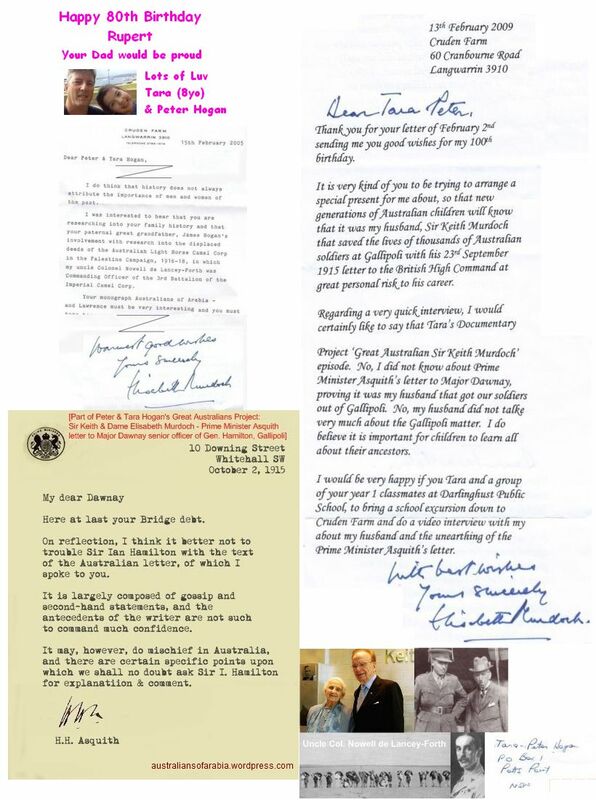 Particularly, Keith Murdoch’s Gallipoli Letter, which we proved unequivocally, got our boys out of Gallipoli by unearthing the subsequent Prime Minister Asquith letter to Major Dawnay – one of General Hamilton’s senior officers (unfortunately Allen & Unwin pretty much plagiarized our work). Rupert is also very much connected to our project through Hackney not just because it is where Edward de Vere wrote SHAKE-SPEARES SONNETS but because that’s where the word ‘hack’ originates – over-used horse or coach especially for hire (they were paddocked and stabled there in the NE London borough of Hackney in the old days) – hence, ‘hackneyed’; ‘hack’ writer, and to more recently, to ‘hack’ into someone’s mobile phone!